The company has invested both in state-of-the-art technology and people to manage, operate and maintain this technology. Clients can be offered a range of trenchless techniques, including mechanised pipe jacking, microtunnelling, conventional tunnelling, guided auger boring and horizontal directional drilling. The company owns and operates Iseki Unclemole, Herrenknecht, Akkerman and Soltau RVS microtunnelling and Pipejacking systems that can install a range of pipe diameters between 600mm and 1800mm. As well as Vermeer Navigator and Wirth Powerbore HDD Rigs between 12 and 70 Tonne pull-back capacity. A E Yates provides advice and guidance on the feasibility and suitability of pipejacking and microtunnelling systems for both Design and Construction, and traditional forms of contract. A E Yates operates a quality system to ISO 9001/2000 accredited by BSI. Barhale is one of the country's leading and civil engineering and infrastructure service contractors, with an annual turnover of circa £ 130 million. 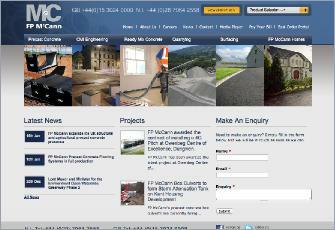 The company operates throughout the UK undertaking works within all sectors of civil engineering and utilities. Its head office is in Walsall, with regional offices in Peterborough, Watford, Haydock and Glasgow. Barhale’s tunneling team has extensive experience in all forms of tunnelling and shaft sinking, as well as vast experience in micro-tunneling and slurry separation along with traditional pipe-jacks, segmental tunnels and timbered headings in all ground conditions. The company prides itself on its professional engineering expertise, and offers clients an advisory service during the design and feasibility stages of any scheme. Barhale Construction Services (BCS), a business unit within Barhale, provides a traditional plant & tool hire service to both internal and external customers. An integral part of BCS is a structural and general steel fabrication business that manufactures specialist tunnelling and pipe jacking equipment such as shields, inter-jacks, jacking rigs, tunnel eye portals, skips and bogeys, as well bespoke access platforms and bridge structures. BCS also operates a sign making service for internal and external customers. 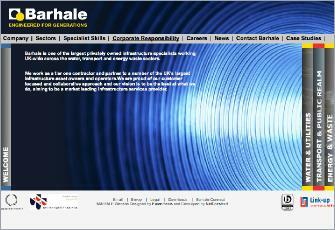 Barhale gained the "Investors in People" standard in December 2001. As an "Investor in People" Barhale ensures that all their staff are fully trained in the skills they will need to successfully carry out their roles in delivering added-value project services to their clients whilst extending their personal development. In October 2003 Barhale were one of the first UK companies to achieve triple certification to OHSAS 18001: 1999, BSEN ISO 14001: 1996 and BSEN ISO 9001-2000. Barhale are also members of the Achilles Verify scheme and have undergone additional audits of its Health & Safety, Environmental and Quality management systems. 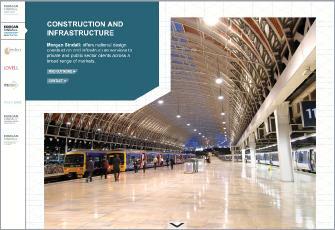 Barhale's commitment to provide value to its customers is demonstrated by award winning projects recognised by our clients and nationally recognised bodies such as the Institute of Civil Engineers (ICE), United Kingdom Society for Trenchless Technology (UKSTT), Considerate Constructors Scheme and, CEEQUAL. Few companies can claim our accumulated experience in underground construction and whilst we are proud of our achievements of the past, our culture is one of innovation and development. We specialise in all types of tunnelling design and construction with extensive experience on major schemes comprising both hard and soft ground. An active planning, research and design facility provides in-depth capability and innovative designs for temporary and permanent works. Our plant holding has the largest fleet of TBMs and specialist equipment within the United Kingdom, maintained at the divisions own workshops in Swynnerton. This includes full face earth pressure balance machines, roadheader and backhoe shields, locomotives, rolling stock, compressed air equipment, ventilation systems, grouting equipment, tunnel services, heavy cranes and a full range of pipejacking equipment, including slurry microtunnelling machines. In addition to the above we have a state of the art pre-cast manufacturing facility, with automated twin carousels and batching systems. The factory was developed on a 13 acre brownfield site at Ridham Dock in Kent. 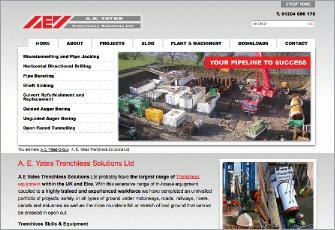 Micro-tunneling, Pipejacking, Auger-Boring, Pipe-ramming, Directional Drilling, Timber Headings and Shaft Construction. 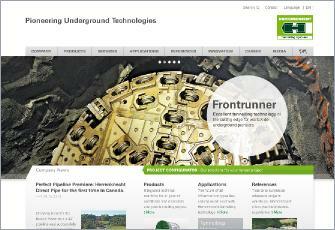 In-house design capabilities allow tunnels and shafts to be designed and detailed. The Company holds ISO9001, ISO14001 and OHSAS18001 certification as well as Professional Indemnity insurance for design. The company specializes in long distance microtunnelling and large insitu caissons designed to water retaining standards. Shafts up to 30m deep by 20m internal diameter have been completed insitu as have slurry microtunnel drives up to 740m long with horizontal and vertical curves. The company is familiar with structural and geotechnical design principles and can offer advice, structural analysis and cost estimates at early stages in project development. International experience has broadened the company's experience and has informed its approach to high risk work. Robust simplified methods can control project risk by avoidance; Ward and Burke offer their experience to all who seek the best engineering solution. Herrenknecht International Limited is a subsidiary of Herrenknecht AG covering the UK and Ireland. Selling and marketing Herrenknecht tunnelling equipment and Bohrtec guided auger boring equipment, giving our customers the ability to successfully complete tunnels of all sizes. Herrenknecht are world leaders in the manufacture of tunnelling equipment, designing and manufacturing a full range of modern tunnelling machines and back-up machinery for pipejack or segmentally lined tunnels. These include mixshield/slurry, earth pressure balance (EPB), excavator, roadheader, rock and auger boring. Continual improvement in design and performance is the cornerstone of our philosophy. We can provide HDD equipment from 60 to 600 tonnes force, direct pipe equipment, vertical shaft sinking machines, and geothermal drilling rigs capable of depths to 5,000 metres. From our large fleet of rental equipment we can provide equipment to offer our customers a total package for tunnel projects and pipejack. 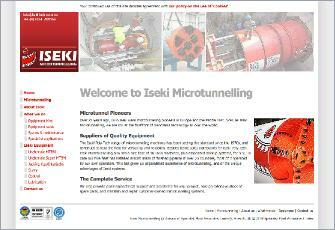 Iseki Microtunnelling offers Microtunnelling Equipment for hire worldwide, and for over 29 years has been a sales distributor for Iseki Poly-Tech., Inc., the world leader in the field of remotely controlled Microtunnelling Shield Machines. •	The Unclemole Super TCS, which adds hard rock-cutting to the Unclemole specification. •	PLC Control System with Fibre Optic data transfer cable, which allows mass data transfer to the operation desk from multiple detectors in the MTBM and the tunnel. •	A “bolt on” rock head for the Unclemole TCC MTBM, widening operational conditions to include medium rock, remarkable performance in coal measure / mudstone / shale / schist / siltstone ground conditions. In addition, Iseki Microtunnelling also offers a comprehensive maintenance and parts service, project-specific design capability, and the provision of experienced machine operators. FP McCann Ltd is the UK's largest manufacturer of jacking and micro tunnelling pipes producing a complete range from 450mm to 2400mm ID in concrete. The company prides itself on its customer focus and innovative approach using its expertise in design to solve customer's problems efficiently and economically. McCann’s Easi- Lift system provides safe and efficient handling of jacking pipes without penetrating the inner wall of the pipe. This system is offered as standard on pipes from 900 mm. All standard product pipes from diameters DN450 to DN 2400 incorporate a Lamell seal capable of maintaining an internal hydrostatic pressure of 35mm (3.5 bar) head of water. For all enquiries please visit our website or contact Stuart Carson / the sales office. For a company with its origins in clay drainage pipes and over 100 years of experience in the manufacture of clay drainage pipes and fittings, it is natural that Naylor Drainage Ltd is at the forefront of product development and innovation. With worldwide operational activities, Naylor Drainage is the world’s leading international supplier of specialist pipes for trenchless technology and many prestigious projects have been supplied both in the company’s domestic (UK) market and around the World. 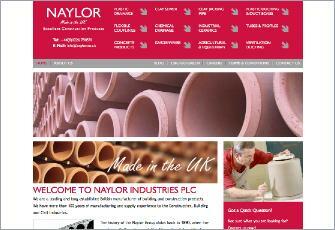 Reputation for product reliability and customer service is all part of the Naylor experience. The Naylor approach to its development of products for the trenchless construction industry has resulted in new manufacturing equipment and production techniques. These progressive steps have led to reductions in specialist product costs. These savings have been passed on to the customer to enable the use of a first-class product at affordable prices. 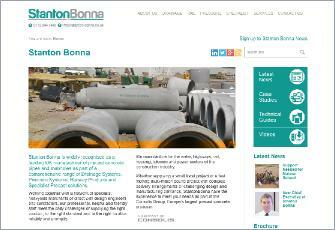 Stanton Bonna is part of the Consolis Group, Europe’s largest precast concrete producer, and is widely recognised as a leading UK manufacturer of precast concrete pipes and manholes as part of a comprehensive range of Drainage Systems, Pressure Systems, Railway Products and Specialist Precast solutions. Stanton Bonna has an excellent reputation for high standards in product quality and customer service. Their professional, helpful and friendly staff, meet the daily challenges of supplying the right product, to the right standard and to the right location reliably and promptly. All Stanton Bonna Jacking Pipes are manufactured to BS 5911-1 and BS EN 1916 and available with a painted mild steel collar or stainless steel collar on request. The integrated elastomeric sealing gasket ensures a watertight joint. Interjack stations with integral ‘cans’ and ‘lead’ pipes are also available. Products are manufactured in accordance with the relevant British and European standards and Kitemarked and/or CE Marked accordingly. For up-to-date information, visit the Stanton Bonna website, where you can find product specifications, alongside case studies and the latest product news. From these roots we have expanded and developed complementary skills and offers a comprehensive civil, structural and geotechnical design consultancy. COWI attracts staff with very wide ranging experience; this experience is the key to the services provided leading to much repeat work and our inclusion on tender lists against companies of greater size. We have worked on tunnelling projects around the world in the design of large diameter tunnels for rail, road and power in both rock and soil in North America, Europe, Middle East, Australia and South East Asia. COWI UK Limited has significant experience of pipejacked and augerbored tunnel design including many crossings below road, rail and river. We are familiar with all the various methods and machines utilised in construction and, crucially, have geotechnical experts who can advise on ground conditions and groundwater behaviour. Thus we not only provide designs, but also add value in terms of construction advice. We also have significant experience of gaining UK approvals from Network Rail, Highways England and other permitting bodies. We have a reputation for being client focused and for solving geotechnically complex problems related to tunnelling and have become highly respected by clients, contractors and other consultants in relation to the geotechnical and structural aspects of tunnelling processes. COWI represented on British Standards Institution and European Standards Institution (CEN) committees for the development of tunnelling safety standards and is represented on the committee of the British Tunnelling Society (an associated society of the Institution of Civil Engineers). Safety, quality and a care for the environment are built into our designs. 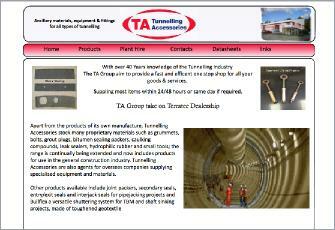 With over 40 Years knowledge of the tunnelling Industry The TA Group aim to provide a fast and efficent one stop shop for all your tunneling goods & services requirements, supplying most items within 24/48 hours or same day if required. Apart from the products of its own manufacture, Tunnelling Accessories stock many proprietary materials such as grummets, bolts, grout plugs, bitumen sealing packers, caulking compounds, leak sealers, hydrophilic rubber and small tools; the range is continually being extended and now includes products for use in the general construction industry. 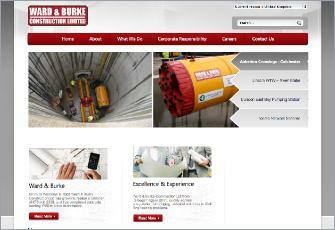 Tunnelling Accessories are also agents for overseas companies supplying specialised equipment and materials. Other products available include joint packers, secondary seals, entry/exit seals and interjack seals for pipejacking projects and Bullflex a versatile shuttering system for TBM and shaft sinking projects, made of toughened geotextile. T. NAGADI PREFORMED CONCRETE GROUP OF FACTORIES (Riyadh, Al Kharj, Yanbu Al Nakhl & Tabuk) are the leading concrete products manufacturing group in the Kingdom of Saudi Arabia. The factory was established during 1977 and it is 100% owned by Shaikh Tarik Mohamed Ibrahim Nagadi. The factory has been licensed under the Saudi Arabian National Industries Protection & Encouragement regulations to produce all types of concrete products in Yanbu & Riyadh – Mainly, Lined & Non Lined Reinforced Concrete Pipes, Jacking Pipes, Sewer & Storm water Electrical & Telecommunication Manhole System, Box Culverts of different Sizes – All Concrete Products Under One Roof! We are approved suppliers for the Governmental & Private Enterprises including Ministry of Water & Sewerage Authority / Ministry of Transportation / Baladiya / Ministry of Agriculture / Royal Commission / ARAMCO / STC & Mobily etc., Our factories have been upgraded to the latest technologies of concrete manufacturing and proud to say, that we are an ISO 9001-2008 certified organization and member of Pipe Jacking Association – London. We have also technical collaboration with European Companies for the latest development in the industry. We also supplying our products to all the GCC countries meeting their specifications in addition we are covering our supplies within the Kingdom of Saudi Arabia, from our Plants in Riyadh & Yanbu. Further expansion is going on to cater the increasing demand in the market.